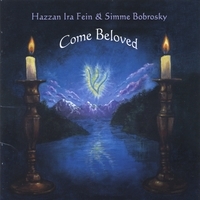 Come Beloved is a meditative journey into the Sabbath Evening Prayers, ever returning us to Sh'cheenah, our Sabbath Beloved, through chants, songs and breath mediations. It is an ever deepening experience of Sabbath wonder, healing and peace. 29 tacks including Sh'cheenah Abaw Sabbath Chant, L'cha Dodee, Shma Chant and Breath Mediation, V'shomroo, Michamocha, R'fooah Sh'laymah and many more.